Interview with Keith Norris, chatting about the differences between paleo and keto, fasting myths and misconceptions, how to use keto to get more out of your fast, portion checking, and so much more. Some of the most-asked questions I get about keto revolve around fasting, and while everyone has a different approach (some people don’t fast at all!) I wanted to be able to have more conversations of what fasting could look like. That’s not to say that today’s episode is the ultimate guide to fasting. What I want you to take away from this conversation is that fasting should be customized for your experience, and something that comes naturally. Just like your version of keto, your version of fasting should be individualized and something that feels good in your body. It all goes back to listening to your body, and I think today’s episode really drives that home. Whatever you do, do you! In today’s podcast, I chat with our guest Keith Norris, health fanatic, keto paleo superhuman, business partner at ARXFit training equipment and Efficient Exercise, author at Theory to Practice, and the owner, co-founder and Chief Development Officer of the largest Paleo conference in the world, Paleo f(x). 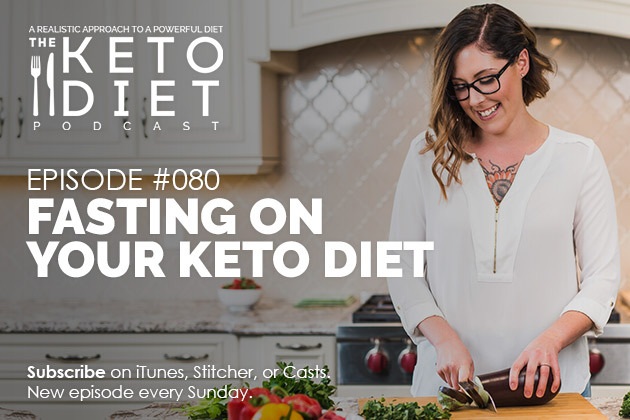 This episode is all about the overlap between keto and paleo, getting more out of your keto experience with fasting, customizing fasting to fit your needs, and more. Don’t miss out — grab your ticket to Paleo f(x)! 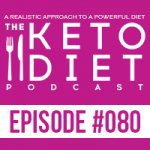 Leanne Vogel: You’re listening to Episode Number 80 of The Keto Diet Podcast. Today, we’re chatting about dispelling fasting myths, getting away with more on a ketogenic diet, portioning checking, and how to do it, and so much more so stay tuned. Hey guys, Happy Sunday. The show notes and full transcript for today’s episode can be found at HealthfulPursuit.com/podcast/e80. Let’s hear from one of our awesome partners. We got one announcement before we get to today’s show. It’s probably one of the largest, biggest, most amazingest announcements ever. I’m so excited about this. I’ve been working on this project for what seems like a lifetime. If you didn’t already catch it with today’s new fancy podcast intro, Happy Keto Body is live and open and it’s waiting for you. You guys can go to HappyKetoBody.com for more details. Okay, today’s guest is Keith Norris. He’s a former standout athlete, a military vet, and an elite strength and conditioning expert with over 35 years of in the trenches experience. As a serial entrepreneur in the health and wellness space, he’s the owner, co-founder, and chief development officer of the largest paleo conference in the world, Paleo f(x). Paleo f(x) will be in Austin, Texas from April 27 to 29. If you haven’t gotten your tickets yet, you have to. It is a really fun event and there’s going to be a bunch of amazing speakers and a bunch of great brands, it’s always a good time. Unfortunately, I’m not going because of Happy Keto Body and the launch and just the craziness around that. Time is running out to get your tickets. You can get them for 20% off for a very limited time. I will include a link to the show notes where you can grab that discount. As well, Keith is a partner in one of the most innovative lines of boutique training studios in the nation, Efficient Exercise. He’s also a partner in the ARXFit training equipment and a founding member of ID Life. In his spare time, he authors one of the top fitness blogs in the health and wellness sphere, Theory to Practice. Without further ado, let’s cut over to this chat. Hey, Keith. How’s it going? Keith Norris: Hey, Leanne. It’s going fantastic. How are you? Leanne Vogel: I’m so good and I’m really happy you’re on the show today. It’s about time. Keith Norris: I am thrilled, thrilled, thrilled, thrilled. Leanne Vogel: For listeners that may not be familiar with your work, why don’t you start off by telling us a little bit about you? Keith Norris: Yeah, I guess for the purposes of our discussion here, I am the co-founder and co-owner of Paleo f(x). A little bit of my background, I am a lifelong athlete. I played college football and I really, really got into the strength and conditioning aspect of college football because I was one of those kids who had to train to stay on the field. I wasn’t just somebody who could get by without training and not hope to compete with the best of the best. I actually had to train to be there. I looked at every possible way to increase performance. That led into a lifelong obsession with just human performance in general. As I started to get a little bit older, and some would argue wiser, I don’t know if that’s necessarily true, but that drive for added performance started to turn into a want for health and longevity kind of over the sporting performance aspect. You know, in the last 20 years or so, I’ve moved more towards that aspect. I dealt in training collegiate football players, volleyball players, and I love the competitive aspect of sports. To me, it’s just raw and pure and it’s unimpeded, but I now see the value in the overall health aspect of training. Just as an aside, just because someone is a fantastic athlete does not mean they’re healthy. I would just throw that out there to people. You don’t have to be this fabulous athlete that’s posting up PRs all the time to be very healthy. In fact, it’s quite the opposite to where these people who are high-performing athletes, they’re like Ferraris. They’re just one bolt shy of a catastrophe. If you look at their blood work, their blood work is pretty sketchy because they’re living life at the edge. To be a competitive athlete, you have to live life at the edge. That’s why competitive athletes don’t stay competitive for very long because a human body just can’t keep up with that battering like that. That’s a very long answer to say I’ve shifted into the health and wellness side of things much more than I have the competitive side of things here of late. Leanne Vogel: Amazing. You guys are doing great work in both the paleo and keto space. Thanks for that for bringing that information to way more people. It’s so great. Keith Norris: Thank you very much. It’s been a blast. It’s been so, so much fun. Especially since we’ve kind of been personally making this shift more into the keto side of things, it’s been a very, very interesting transition. That’s been very, very cool. Leanne Vogel: We’re going to chat all about that today. Before we get started with the questions I have for you, I like to ask every guest: What does keto mean to you? Keith Norris: You know, for me personally, keto means ease. I am a super, super busy person. The business side of things is one aspect of my life, but I still love to train and I’m still on the go all day long. Most people look at my schedule and they’re like, “You’re freaking crazy. There’s no way you can keep up that kind of schedule.” I don’t see it as a grind, I see it as an opportunity. Every moment I have, I’m engaged in something. For me, keto allows me the freedom to not be tied down to specific times of day where I have to eat. It frees me from brain fog. It frees me from the old hangry thing at midday. My day can pretty much just go seamlessly and I eat when I’m hungry. Also, I don’t have this massive belly bloat from having to stuff in a lot of calories that otherwise would have come in many, many years past. It’s been forever since I’ve relied on refined carbohydrates, but there was a time in my life when I pretty much ate like everybody else to where I would have that. To horse down enough calories to get me through the day, I had to eat a lot volume-wise. I don’t have to do that anymore. For me, it’s freedom and, on top of that, it’s the fantastic health benefits that come with it. It’s kind of the best of both worlds for me. Leanne Vogel: Awesome. The way you see it, you mentioned just a little bit the transition between paleo and keto. What are the differences between paleo and keto? Keith Norris: I see keto as a subset of paleo. We can all agree in the keto camp and the paleo camp, which, again, I see is just we call it a subtribe within the overall tribe of the paleo camp, but I see it generally as a macronutrient thing. Obviously, on the keto side of things, we’re going to have a high-fat, moderate protein, low-carbohydrate diet whereas if you flip it back around to the paleo side of things, it’s pretty much macronutrient agnostic. I have friends and associates who, when you look at their overall diet, it looks like a pescatarian diet. There’s a lot of vegetable matter, there’s a lot of starchy matter, and a smattering of like fish and seafood. In my mind, that is you could call it pescatarian. In my mind, that looks very much like a paleo diet because you’re not eating grains and they’re not eating sugar, but that would definitely not be a ketogenic diet. You know, those are kind of the extremes on each end. I think for myself, I have played with a ketogenic diet not really knowing it was a ketogenic diet. I shouldn’t say not knowing, but I knew full well and I’ve known full well what a ketogenic diet is from back in the late 80s, but I didn’t follow that diet religiously. I played with it a little bit, and I just kind of ate ad libitum. I just ate, and I just naturally gravitated towards a higher fat diet because of all of the reasons I listed before, because I liked being able to be satiated for long periods of time and not have to rely on where my next meal was going to come from. I don’t know. That’s, again, a very long-winded answer to a very easy to answer question. Leanne Vogel: It’s good to go through the thought process. I agree with you. When I first found keto, I had been dabbling in paleo and I wasn’t getting the results that I wanted. When I saw keto, I saw it as being a completely different eating style. I made it so overly complicated when really it was just like where you’re eating carbs, eat fat, and where you’re eating fat, eat carbs. Just do a total swap. It’s really an adjustment on a paleo diet if you’re doing it a whole foods-based approach, which I found that will be better for you in the long-run than some of the keto approaches that we’ve all seen on Instagram and other places where it’s like, no, you probably shouldn’t be eating that right now. Although it’s keto, it’s probably not safe for you. How is your relationship with fasting? Was it something that you started when you were keto or did you play around with it with paleo too? How did that all come about? Keith Norris: You know, the whole fasting thing came about for me. I think if I go back to when I would consider myself more paleo, it was still a pretty high-fat diet. It might not have been high-fat to keto standards, but it was still a pretty high percentage of fat. My personal take on fasting is I eat when I’m hungry and the opportunity is there. I’ll give you a for instance. Most days, I get up in the morning, I do my thing. I will have coffee, water, and I won’t actually eat anything well after what most people would consider lunch. It’s past noon for sure and a lot of times into 2:00 in the afternoon. I generally get up around 7:00, if that gives you an idea of how long my morning fast is. It’s not all the time. For instance, I got up this morning and I was hungry so I ate. I really don’t give it a whole lot of thought. It’s unusual that I’m hungry when I get up in the morning, but today was one of those days. I don’t worry a whole lot about it. I had some beef sausage and eggs cooked in real butter. I probably won’t eat again today until we eat dinner tonight. That will be around 6:00. That gives you just an idea. For me, it’s not hard and fast. I don’t make any rules, which probably fits my personality because I am not a rule-follower. In fact, if you give me a rule, I’ll figure out a way around it. It’s just my personality. Leanne Vogel: I’m the same way. Keith Norris: I am just allergic to rules or can’t-dos. Every time this subject comes up, I give a shout out to my mom. Mom, I’m sorry. I was just that kid. Any time I was confronted with a “you can’t do this” or “you shouldn’t do this” or a rule, that was like a challenge to me. That means that’s something I am going to do. I am going to challenge, and I am going to try to figure out a way around. For me, on the diet side of things, that has worked very, very well for me because I didn’t have those rules. It allows me the freedom to do all the creative things that are very, very important to my business and very, very important to my mental and emotional health. This diet, this lifestyle allows me to do that. Again, this all comes back to I don’t have to plan a specific time during the day where it’s like I’ve got to eat or I’m, A, going to be unproductive or, B, going to be hangry. It gives me the liberty to be able to do that and stay healthy. Now, on the other side of this, I should point out that I have always been healthy my entire life so I don’t have any medical conditions that would necessitate me really, really clamping down on my diet or eating within specific times or anything like that. I realize there are people out there who do have to be a little bit stricter and more structured in their dietary practices, but that’s just not me. Leanne Vogel: More on my interview with Keith Norris after this message from one of our podcast partners. What sort of myths did you encounter with fasting? I know that, and this could just be when keto was first coming out, I would chat with some of my paleo friends and they would be like, “Oh, no, no. That’s really unhealthy,” the fasting and things. I think things have changed, specifically in the paleo community and keto, and now we’re kind of almost best buds, which is great. What kind of myths did you encounter when you first started fasting? That’s probably something, the biggest myth that I have in my own mind dispelled simply because now that I do longer fasts, it has not affected my muscle mass in the least bit, which, like I say, 15 years ago may have been very, very counterintuitive to me because I was looking at this whole energy, if you want to call it the energy balance, which we know is not a true representation of what’s going on in the body. If we want to look at it that way just for conversational ease, the body doesn’t work on a short clock like that. The body works over the long haul. Not eating for 16 or 20 hours a day and getting the bulk of your calories in a very short window, you know, the body doesn’t really care a whole lot about that. Yeah, that was one of the biggest myths that was dispelled. I’m trying to think of another myth. I think kind of tied to the muscle mass thing would have been the metabolism idea that fasting like that would “slow your metabolism.” I don’t think that has panned out either for the same reason. The body works on a longer clock than what maybe our minds think it does. Leanne Vogel: Yeah, I completely agree. For me, it was definitely the metabolism piece. I was terrified of it too, but I just went for it. It’s been fine for the last four years so I think we’re onto something. Do you test your ketones? If so, do you find that fasting affects your ketones? Keith Norris: You know, I used to test ketones just out of curiosity and it kind of didn’t matter. Let me back up and say I would test them in the morning because that’s when I had the opportunity. I’m pretty much on the go after I leave the house in the morning and I just didn’t want to hassle with taking a tester with me or anything, to be quite honest. I would test them out of curiosity in the morning. It kind of didn’t matter what I ate in the short-term. I was always, and this is my blood levels were always around between like .3 and .5 every morning. My glucose reading was always 80-ish in the morning. It kind of didn’t matter what I ate the night before. Now, I’ll back up and say 95% of the time, if not more, if you look at my diet, it is a ketogenic diet. You would look at my plate and go, “Wow, that’s a ketogenic diet,” but every now and again, I will go off the reservation and have a hamburger and fries. That’s pretty much my going off the reservation meal is I love a greasy hamburger and just old school fries. Every now and again, I’ll have that. It’s very, very rare and the circumstances have to be right and the sun and the moon and the stars align and it’s just one of those things that happens, but the curious thing about that is is it doesn’t affect my, A, glucose, or, B, ketone levels the next day. Now, that’s not to say I could do that all the time and have that same result. This is just the result of a body that has been accustomed to this way of eating and is just very, very resilient at this point to an assault. I would consider that type of a meal an assault on the body. I’m not doing it thinking in any way that it’s healthy. I’m doing it just because, you know, I like to have a tequila now and again. I like to have a hamburger and fries now and again. I think that’s to say that if you treat the body well over the long haul, you can get away with assaults now and again and it snaps right back. That’s what the body does. It’s very, very adept at that. You know, in the same way that it’s adept at rebounding from other stresses that we might consider more beneficial, that being the stress of weight training or something like that. The body is built to rebound from those types of stresses if they’re not chronic stresses. I think that’s the key. You don’t want that kind of stuff to be chronic. Leanne Vogel: Yeah, that’s a major takeaway. Once now that I find that my body’s pretty balanced, I still deal with some issues, but not like it was five years ago. I can get away with more and I have a little bit more leeway, whereas before if I have a couple baby tomatoes, I don’t really feel joint pain, but a couple of years ago if I were to have even like a slice of a baby tomato, it would be like game over. I’d be in so much pain. I don’t abuse that, but if I accidentally have tomatoes in a salad, then it’s not like, “Oh, shoot. Send back the salad. That will make me really sick.” It just allows you to live your life a little bit more. I think you said it really well. Keith Norris: I think the other part of that is psychologically you don’t crave the stuff that hurts you very often. I mean, there’s many times where I have the opportunity to have the quintessential burger and fries and I’m just like, “Nah, I’m not feeling it. I’m not feeling it today.” Yeah, there’s plenty of opportunity in front of me that I don’t capitalize on, but at those times when I do, I snap back very, very quick. Leanne Vogel: Yeah, that snapping back is imperative. More of a lifelong strategy to be able to have more leeway, I agree with you. A burger and fries is something I rarely enjoy, but if I’m out and it’s been months and I’m with friends and the circumstance, like you said, all the stars aligned and everything’s cool, then I’ll have that burger and fries. Also, when you give yourself that leeway, it’s no longer like, “Oh my gosh. I’m going to have this burger and fries when I shouldn’t be eating this.” Then you end up overeating because you know you’re never going to have it again. Now, it’s like usually I’ll leave half the fries on the plate because they’re just not crispy enough or I’m just full. Keith Norris: Or the flip side of that is beating yourself up psychologically or emotionally for having that food and that doubles down on the negative effects of the food because now your cortisol is off the charts because you’re super, super stressed about what you did. It just becomes a downward spiral very, very quickly. You know, the whole emotional/psychological side to food, you know, Leanne, we’re just bizarre animals, these animals with these consciences. It’s definitely a double-edged sword. We have to watch that too. The self-loathing type of thing does not do a body good. I would even argue in many, many instances that is the worst offense over and above the food. I mean, that’s a loaded topic, but it’s very, very true. Leanne Vogel: It definitely does. The amount of times I would eat something like even on a ketogenic diet going over five grams of carbs and how stressed that would make me for days, like days. It’s really not worth it. More on my interview with Keith Norris after this message from one of our podcast partners. To get back to fasting, what sort of methods have you tried? It sounds like me, you’re kind of just like, “When I’m not hungry I don’t eat. If it’s 24 hours, great. If it’s 18, cool.” You don’t really care. Keith Norris: Yeah, it’s very, very much like that. It’s very, very loose. Again, that is a freedom for me because I’m, A, already healthy. I get it if people are doing this to try to lose weight, if people are doing this because they have a medical condition, yeah, you have to be a lot tighter on this. For me, right now, it’s just a point of flexibility and freedom. To me, that means everything. After we get done with this podcast, I hop on my bike and I start my commute and I’m probably going to go lift. I’m going to do a lot of Paleo f(x) work after this. Nowhere on my radar until 6:00 tonight when I know we have dinner plans, a business dinner, eating is not on my radar at all. It doesn’t affect my day. It’s nowhere within my plans. I think the only time though that I make a plan to fast or somehow manipulate my diet to accommodate a longer fast is if I’m traveling. If I’m going to spend the day in the airport and I know that your food choices in airports, although they’ve gotten better in the last few years, which is really, really cool to see, they’re still not the best. Whenever I’m traveling, I just plan that I am not going to eat. Now, that travel may be a couple hours. Okay. That’s cool. That’s a normal day for me. Sometimes the travel is an all day long thing that I’m like, “Okay, I’m going to have to eat a pretty good sizable meal before I leave and just assume I’m not going to eat again for 24 hours.” That’s probably the only time that I plan out a fast. Other than that, yeah, it’s pretty loose and it just flows right along with my life. Leanne Vogel: I feel like two peas in a pod. I agree with you. That’s the only time I plan my fasting is I’m going overseas especially, if I know I’m going to be in the air all the time. On book tour, I know when I’m on tour and I’m going back on tour in June, it’s like I don’t eat in the day. When I’m presenting, I’m doing my stuff, I haven’t eaten all day. After the tour, around 10:00 PM, I have my only meal. I go to bed and I repeat. It’s so much easier. Like you said, it’s not … the eating part is no longer part of your day. I think a lot of people, would you agree, make the mistake when they start keto of like, “Day one, now I’m keto. I’m eating low-carb, high-fat, and I’m fasting”? They’re like forcing themselves to fast. Now there’s fasting calculators where you can time yourself and it will alert you when you’re allowed to eat. It’s like, guys. Keith Norris: I’m a little bit of mixed opinion about this because I do realize the value in tracking at least initially for people, especially like food calculators. For instance, Michelle is going through this period right now where she’s trying to dial in on portions because she’s realized that she really doesn’t have … This is someone who’s been in the game for a long period of time. Even she has realized that, “Wow, I have really overestimated,” in this case, depending on how you want to look at it, “what a portion is.” She’s backing up and taking the time to weigh and measure for a while so that she can now re-come to grips with how much a portion of whatever is. What is an entire avocado? What is a normal-sized avocado? What is the weight associated with that? Those kind of ideas. I kind of don’t care. I mean, I just eat, like I say, ad libitum. I know what a good food is and I’ll eat until satiation, but she wanted to dial this in more and see what that is. She’s been tracking. Especially in those instances when people come to this from a SAD diet or some kind of a transition or they’re coming into it, they haven’t had a healthy relationship with food at all. Back when I was training more, I used calculators for this purpose, to get people to realize what a portion was, how much they were actually eating during the day, and to help them wrap their minds around it with the idea that, as soon as possible, we’re going to transition away from tracking because I don’t want you to be married to this. I want you to be able to go by feel. I want you to be able to eyeball stuff because you’re going to have to live a life in some kind of a normal day to day existence if this is going to stick. For the short-term, we might need this tool to be able to get you there, but we don’t want to keep this as a long-term thing. As it applies to fasting, this is where I’ve seen this go off the rails. Here’s a scenario for you. I’m training a 40-year-old female, single mom, three kids. She’s an attorney. She’s working 70+ hours a week at the firm. She’s a Type A personality. She’s recently transitioned to keto, even though I have told her, “Let’s not do that just yet. Can we just not worry about that right now because you have so much other on the plate? This is going to add to your stress levels. It’s one more added thing that is going to be added to your stress level. That’s going to affect your cortisol and you’re already a Type A personality.” These are the type of people who are going to do this, by the way. No, and on top of all that, now she wants to throw in this intermittent fasting aspect. This is the very person who’s going to get the app that’s going to force her into these windows of eating and it’s goes off the rails so quick. It’s because we’re just hyper-focused on trying to be perfect with this and all it does is add another stress into the whole mix. It doubles down on a bad relationship with food. You have to kind of unravel all of these knotted twine that are in this knotted ball of twine. You’re trying to unravel all of this stuff and it just becomes a mess. Then, what would happen is now this person, because of all this added stress and this is one more thing they’re having to deal with and they’re a Type A personalty already, now they start to have hormonal issues. Then they blame their hormonal issues on, A, age, or, B, that they’re not doing the diet hard enough, good enough, or they’re not fasting hard enough, good enough, all of these other things that are just doubling down on a condition that has now erupted. It’s very hard to back somebody off the cliff of that because that’s our Type A culture. It’s a diet better, diet harder, fast longer. I’m just waiting for the small intermittent fasting to turn into, I don’t know, something weird like I’m going to eat all I can for two days and then fast for five or something. I don’t know. I’m sure that’s already erupted somewhere. This is our mindset. This is kind of the funky relationship that we have with food in North America. Leanne Vogel: Yes, totally. I love that Michelle is doing that. Something that I recommend that my clients do, especially once you get the hang of the ketogenic diet and you’re like life is good, once a month, maybe for three days, start portioning out your food and weighing and tracking and just kind of get a sense of where you’re at because sometimes your eyes become a lot bigger. All of a sudden, half an avocado is now all that stuff, you know. A whole head of broccoli is one serving of broccoli. All of a sudden, your portions are off. Then, your energy is off. You’re not sleeping. It’s like, “Okay, go back to basics.” Three days out of the month, track, weigh. It can be good to kind of like dial in on your portioning and just a really easy way to check yourself and see how things are going if you have specific goals in mind that revolve around it. Keith Norris: Every now and again, for a hoot, I’ll kind of weigh and measure my stuff. Yeah, it would floor people, the amount. I’m just not a big carbohydrate eater. Every now and again, like I say, I’ll have the full-blown bun on the hamburger, which is a massive carbohydrate load for me. I’m just not a big carbohydrate eater unless I’ve done two or three days back to back of very heavy workouts. Then I will have that craving. Well, that’s natural. Your body’s already learning this and it’s trying to set you up for the next assault that it’s assuming is coming down the pike, in those instances. My cravings at that point are more starchy tuber type of cravings. That’s really the only time I have any kind of a carbohydrate craving. Other than that, man, I’m a meat and fat guy. I run very, very well on that. Leanne Vogel: Me too. Me too. Well, thanks so much for coming on the show today. Where can people find more from you? Keith Norris: Well, I would encourage everybody to go to www.paleofx.com. That’s our webpage. I am also on Facebook, Keith Norris on Facebook. I’m also on Twitter, Keith Norris on Twitter. Theory2practice, with a number two, @theory2practice on Instagram. Leanne Vogel: Perfect. 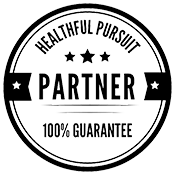 We will include all of those links and everything over on the show notes, which you guys can get at HealthfulPursuit.com/podcast/e80. Thanks again for coming on. Keith Norris: Thank you, Leanne. It was wonderful to be on. Wonderful to talk to you.